(moved to offer to newbies too). I went with a tube amplifier in my 2-channel system (Dynaco ST-70), so just recovering some funding. 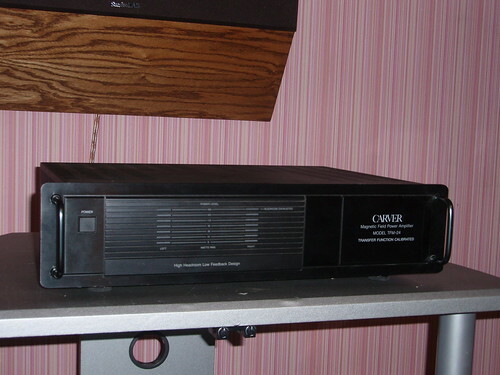 Carver TFM-24 amplifier for sale. 225W/ch into 8-Ohms stereo, 350W/ch into 4-Ohms stereo, 350W/ch into 8-Ohm mono. Same amp as TFM-25, but with LED meters in front instead of analog meters. Condition is very good. The only thing is that previous owner replaced the original binding posts with giant gold-plated binding posts, which are supposed to take 6 or 8 AWG wiring. He did not do a good job doing the cutout. I resoldered and cleaned all connections, so it functions perfect. Bigger photos (and more photos) are available upon request. I'd be interested if it is still available. I never paid alot of attention to the 22 and 42... bud damn... those look pretty Lightstar'ish !!!! Do they have LED's behind the face, or light bulbs ?? DAMN that would look SWEET with Lightstar Blue LEDs running in it !!! How do you like the Dyanco, and did you build it or buy it aready put together? Toy Maker wrote: Do they have LED's behind the face, or light bulbs ?? I am pretty sure they are LED's. Beemers417 has a TFM 42 and I think it will be down at Carverfest as a backup amp. Toy Maker wrote: I never paid alot of attention to the 22 and 42... bud damn... those look pretty Lightstar'ish !!!! Hey, yeah, they are red LEDs. From what I found, you really need to push this amp to higher volumes to get the LEDs running up and down. The way I use(d) it - I'd be lucky if the LEDs went up to 3 squares, lol. DaveS wrote: How do you like the Dyanco, and did you build it or buy it aready put together? I bought the Dynaco already built (vintage build, cloth-covered leads on the transformers - not sure if it really matters, in my opinion). Replaced all electrolytic caps, including a big multi-capacitor can. Replaced input and output connectors, and replaced the power cord. I also worked on the board a little bit to clean it up, re-soldered all solder joints - just minor stuff. The amp is really good, and a lot of people are surprised that it runs my rebuilt maggies (MGII) without any problems (that's only 35 Watts per channel). On the other hand, I got Dynaco PAM-2 preamp (I believe, that's the model number). Rebuilt it (replaced a lot of parts), rewired most of it, cleaned all the switches... and I don't like it . It hums a little bit on phono - I guess, it's the nature of those old vintage designs. And it doesn't sound as good as I expected it. 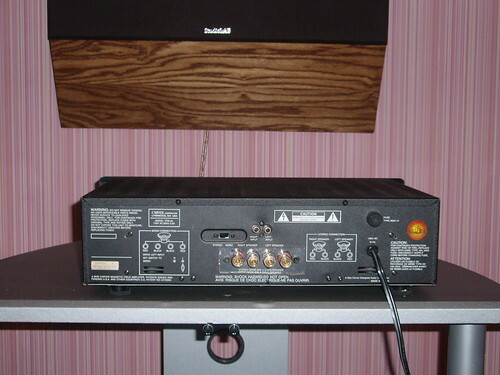 I am really thinking of going back to Carver C-1 / Cambridge Audio 640P combination for my phono (these two will stay in my system for a long time, as a reference). I don't think you can get a quieter phono preamp than SS. Not necessarily more musical, but quiet, yes. I am bringing two TFM-42's down to the fest for back up. Trade bait???? peck555 wrote: I'd be interested if it is still available. I did reply to your e-mail. PM / e-mail me your zip code for shipping cost. Thanks. PM'd you, been working and haven't been on the site. Hey ViperZ, where are you? I want your amp. Never mind, OCCD kicked in, I don't need it any more. Haven't been to this site for a looong time. OCCD has still been clicking, and I am a happy owner of M-1.5t now. Upgraded/replaced the big electrolytic caps in it, and it sings... Which means TFM-24 is just sitting quietly in the corner. $280+shipping is the deal on this amp.